Shopping wheelchair lifts for vans? United Access offers a variety of handicap mobility lifts and wheelchair vans for sale. A wheelchair lift is a convenient motorized platform designed to raise and lower a wheelchair user into a wheelchair accessible van. A wheelchair lift can be installed under your handicap van, leaving the interior free of barriers. Also available is an interior mobility lift for a van. These interior wheelchair lifts are the Millennium Lift and Century Lift. All BraunAbility wheelchair lifts are automatic and designed for installation on the side of a full size van. Transport your wheelchair or scooter inside or outside a vehicle with a Bruno wheelchair lift for your handicap van. All choices offer easy operation and hassle-free dependability. United Access offers scooter and wheelchair lifts for vans through Harmar, which can be installed on the exterior or interior of your van. Talk to our Mobility Specialists to discuss what options are available for a wheelchair lift. VMI/Ricon provides a wheelchair lift for a full size van. Some options include the Reliant, KlearVue, Clearway and Slide-Away. VMI focuses on wheelchair lifts that do not obstruct your view in the side of the van, the doorway and/or the passenger seat. The Armstrong Lift™ Power-Chair Wheelchair lift provides users with luxury and convenience. This wheelchair lift, in its folded position, creates 100% interior floor space without having to replace or modify the rear compartment doorway. The Ergonomic Handle has convenient Up and Down button controls and requires very little effort to swing the wheelchair into van stowage space. Also, the Lifting Arm can be conveniently removed from one van within seconds and reconnected in another, without any tools! (Installation Kit must be in each vehicle). Innovative side-mount wheelchair lift design increases rear bumper clearance for loading and unloading. Powerful Actuation Motor has up to a 350 lb. lifting capacity and wheelchair lifting travel of 43 inches. 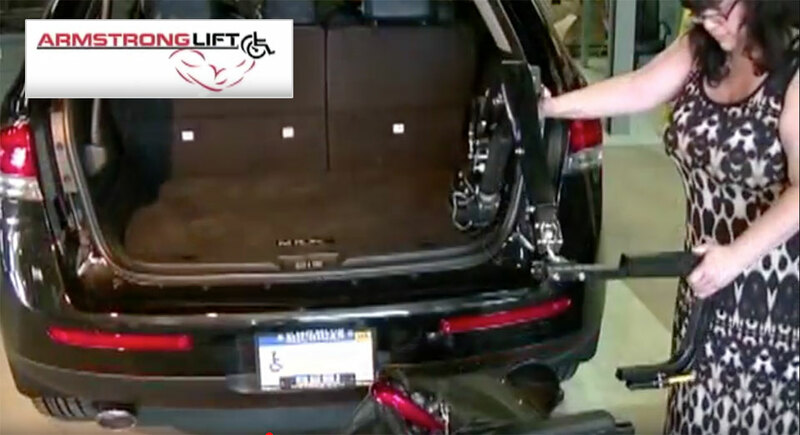 Call a Mobility Specialist at 877-501-8267 and let United Access help you find the right wheelchair lift for your van.